“Who is Ada Lovelace?” might be a legitimate question in light of several Ada Lovelace related events that recently happened – initiatives all over the world accompanying the official Ada Lovelace Day on the 9th of October 2018. Despite these initiatives, the name Ada Lovelace still is a fairly unfamiliar one to many people. Quoting from Sydney Padua’s biographic comic book about the life of Ada Lovelace, she was born in 1815 as the “one and only legitimate child of ‘mad, bad, and dangerous to know’ Lord Byron” (1). But beyond being the daughter of a famous poet – and this is what she gets all the credit for on Ada Lovelace Day – she was a mathematician and the first programmer. You can find an interesting overview of the life of Ada Lovelace here. It was Ada’s mother who introduced her child to science, and who facilitated and valued a mathematic education. Later, when Ada was 17 years old, the mathematician Charles Babbage became her friend, and Ada became fascinated by his idea of the Analytical Engine, a machine that had all the elements of a modern computer. In 1842/43, Lovelace translated an article about the Analytical Engine, written in French by Luigi Menabrea after he attended a lecture by Babbage, into English. The result was an article of three times length due to elaborations and footnotes she added and with which Babbage was impressed. Ada Lovelace was the first person “to write and publish a full set of instructions that a computing device could use to reach an end result that had not been calculated in advance” (2), which makes her the first computer programmer, a software pioneer so to speak. Today, Ada Lovelace is far more than that: She is a symbol for women and their role in STEM related fields and careers, and a motivation to discuss these topics more openly and ambitiously. To encourage such dialogue is also what we had in mind when creating our own ETHOSLab event in celebration of Ada Lovelace. 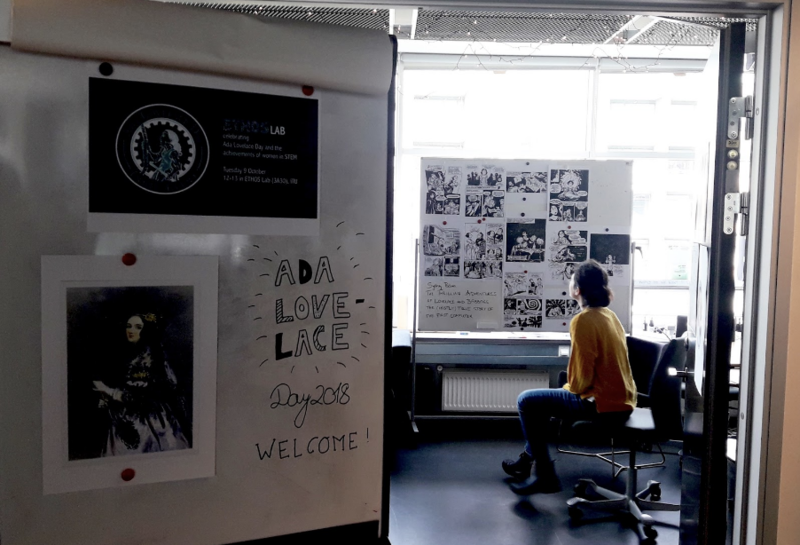 Following the motto Comics & Cake, the ETHOSLab hosted an Ada Lovelace inspired lunch break event on this year’s Ada Lovelace Day, the 9th of October 2018. We printed and exhibited an extract from Sydney Padua’s aforementioned comic book The Thrilling Adventures of Lovelace and Babbage: The (Mostly) True Story of The First Computer (2015), and ordered a huge dark chocolate raspberry cake with a sugarcoaty Ada Lovelace picture. With the doors widely opened, our lab and the space outside quickly filled around lunch time, and in the end, about 30 students and staff from IT University gathered to have a piece of cake (after taking a picture, of course) and to celebrate the day and women in STEM. With ITU’s curricular focus on a domain that is often considered ‘male’ – information technology, informatics, software programming and the like – initiatives that discuss and celebrate women in STEM are of particular relevance for this institution. The guests at our lunch break event not only discussed the arrangement of family life and career, but also the pros and cons of gender quotas in workplaces and the necessity to develop infrastructures that actually empower women in STEM related careers beyond the popular claims made. We want to thank all our guests for their active engagement and look forward to seeing you again next year at Ada Lovelace Day 2019! For more information on Ada Lovelace and Ada Lovelace Day, please visit findingada.com. (1) Sydney Padua (2015): The Thrilling Adventures of Lovelace and Babbage: The (Mostly) True Story of the First Computer, Pantheon.